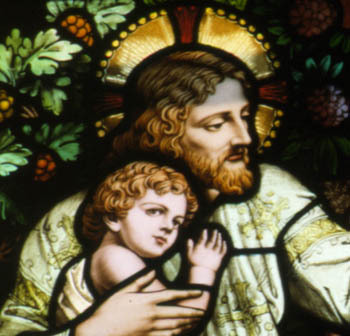 This window offers a traditional version of a popular stained glass subject, which can be found in many church windows. 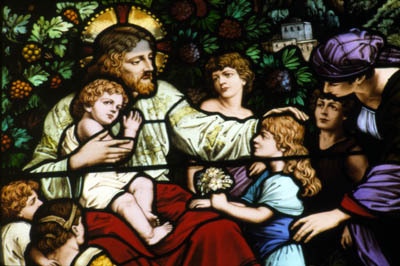 Jesus is shown seated with little children gathered around him. The scene is based on words attributed to Jesus, "Let the little children come unto me, for of such is the Kingdom of Heaven." A contemporary interpretation of this scene can be viewed by visiting the Window of the Month for November 2000. Dedicated in 1882, Saints Peter and Paul Church was designed by Detroit architect Peter Dederichs in the Romanesque Revival style. Its windows were created by the Detroit firm of Friedericks & Staffen, later renamed the Detroit Stained Glass Works. 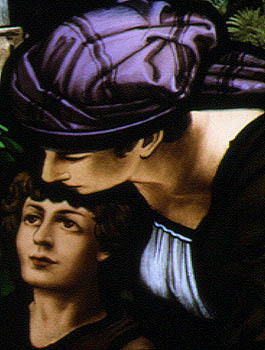 To view another window in this same church, visit the Window of the Month for December 1999. Text by Betty MacDowell, Michigan Stained Glass Census, July , 2002.